So, how does wind power work? I will answer this question for you on this page. 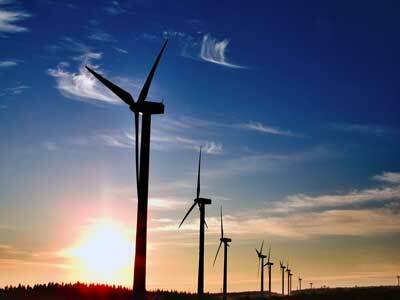 For links to other aspects of wind energy, please see the main wind energy page. Wind is a form of solar energy. Winds are caused by the uneven heating of the atmosphere by the sun. Follow the link for a detailed explanation to the question - What is wind? This mechanical power can be used for specific tasks (such as grinding grain or pumping water) or a generator can convert this mechanical power into electricity. Wind power is an environmentally inert, clean, and inexhaustible source of electrical power. So how do wind turbines make electricity? Simply stated, a wind turbine works the opposite of a fan. Instead of using electricity to make wind, like a fan, wind turbines use wind to make electricity. The wind turns the blades, which spin a shaft, which connects to a generator and makes electricity. Take a look inside a wind turbine to see the various parts. Instruments measure the wind speed and direction of wind turbines. When the wind changes direction motors turn the nacelle and blades around to face the wind. The nacelle (the box at the top of the turbine) is also fitted with brakes, so that the turbine can be switched off in very high winds, such as during storms. This stops the turbine from being damaged. All information is recorded by computers and transmitted to a control center. This way people only have to visit the turbine occasionally for a mechanical check. The real situation is of course more complicated, with many types of wind turbines, different types of generators and safety systems - but this is a good guide to the basics.